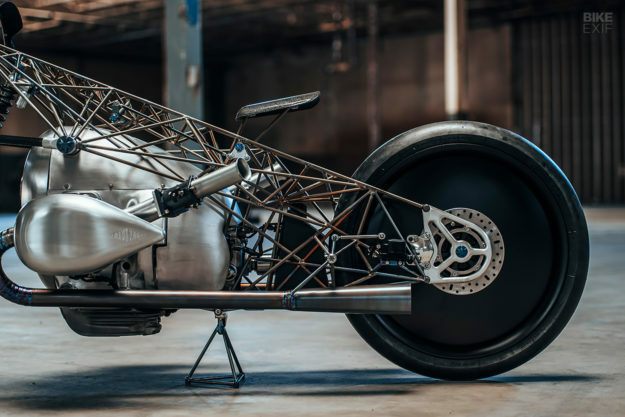 BMW Motorrad have something big in the works. All they’ve shown us so far is a boxer engine and a drivetrain…but they’ve teased these in the most spectacular fashion. 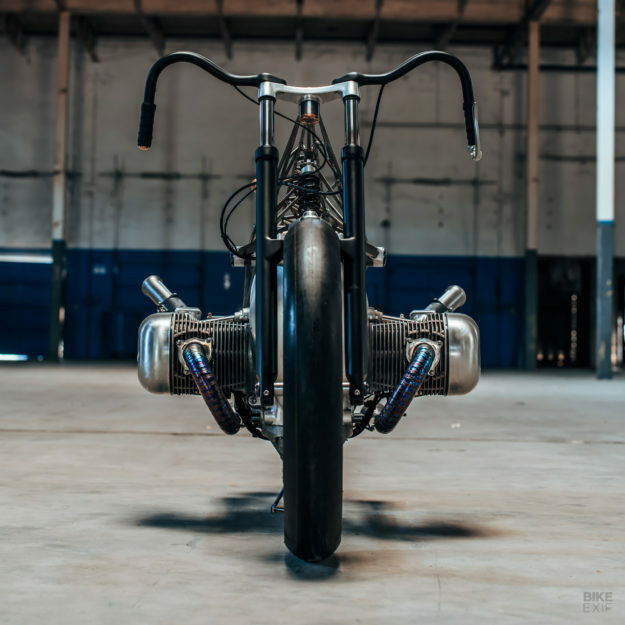 With huge cylinders (we’re guessing a total capacity of around 1,800 cc) jutting out on either side, Revival’s challenge was to design a ground-up custom that would carry that mass—and emphasize its shapely beauty. So how did Revival get from that ideal to this exquisite, wire-framed oddity? By drawing inspiration from an old infatuation: the birdcage-framed race cars that Maserati and Porsche famously built in the late 50s and early 60s. 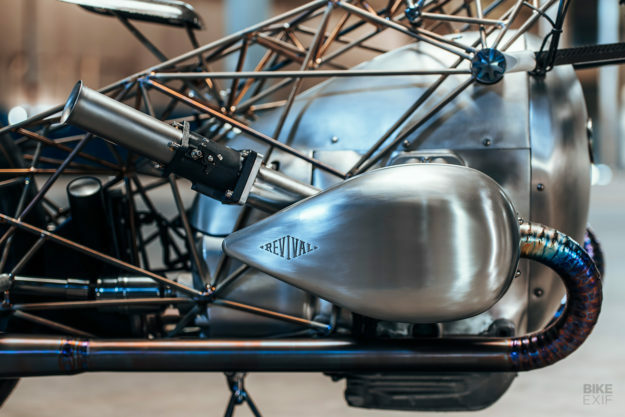 The Revival crew decided to work with titanium, picking it for its low weight and high strength. And as you’d imagine, crafting the framework took more than a minute. 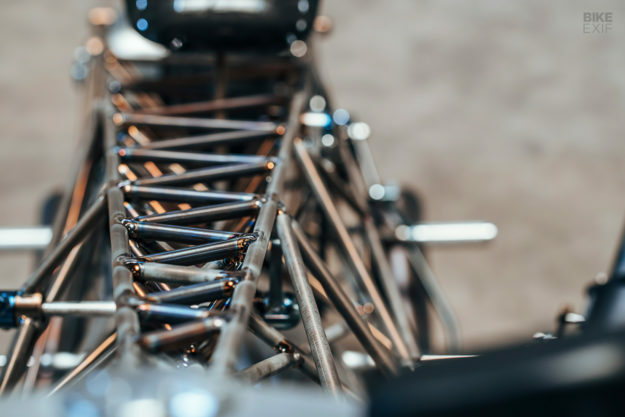 The main structure is made up of 138 carefully cut, coped and welded titanium frame members. 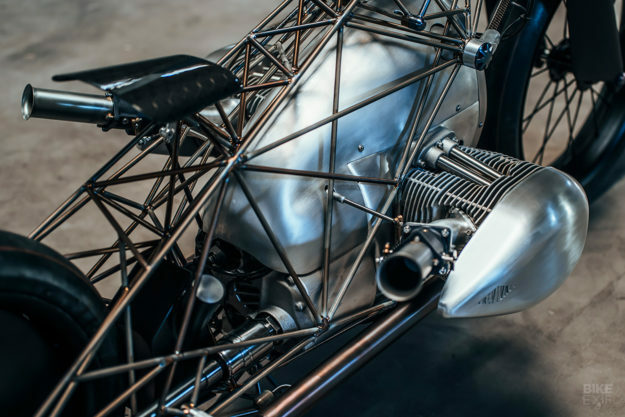 Every one of the motorcycle’s essential components attaches to this main ‘birdcage.’ And even though everything’s bolted in exactly where it needs to be, there’s a lot of free-form design going on too—thanks to the inherent asymmetry of BMW boxer engines. From there, Revival built a front suspension system in the same vein as BMW’s famous Telelever design. They designed the front end in CAD first—running simulations to make sure it would function well. 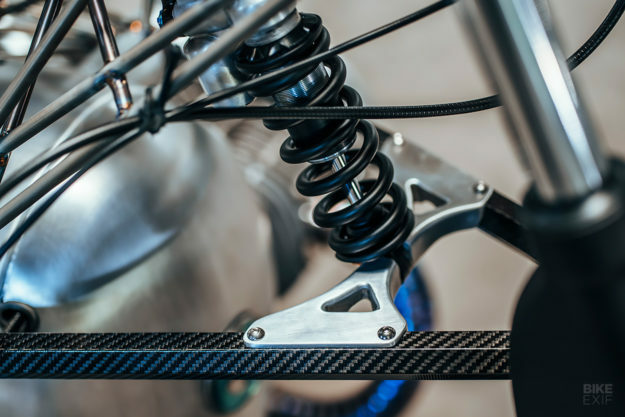 The fork lowers were lifted from a BMW R 1150 GS, and the shock is an Öhlins mountain bike unit. 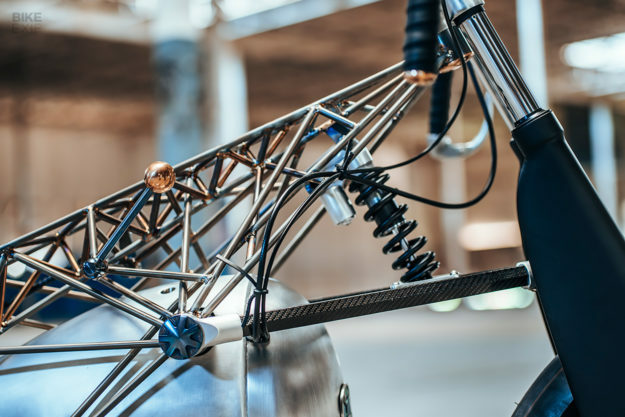 The rest of the setup is a mix of CNC-machine aluminum parts, and hexagonal carbon fiber tubing. 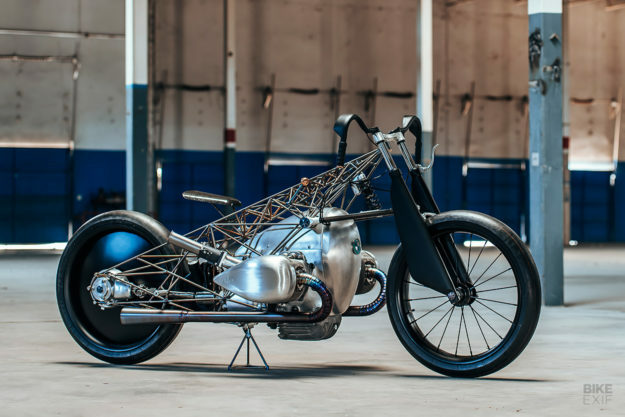 The forks—and handlebars—were shaped to pay homage to another Revival favorite: the iconic Ernst Henne BMW Landspeeder. 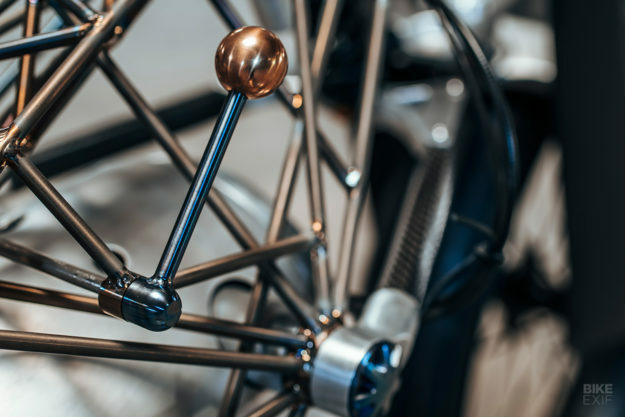 The controls are especially unique—both the throttle and classic inverted clutch are routed internally, and there’s a hand shifter mounted to the right of the frame, with a carbon fiber linkage. 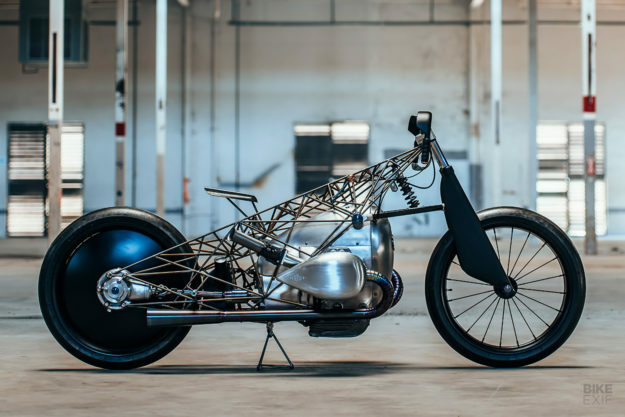 Tricky engineering and enviable materials are all over this boxer-powered machine. 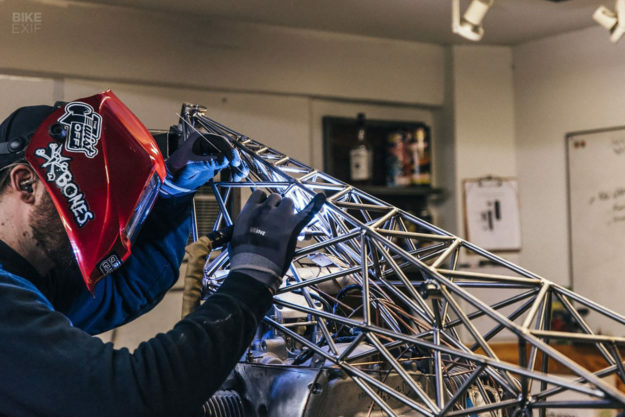 Revival’s lead engineer and fabricator, Chris Auerbach, went to town on the details. 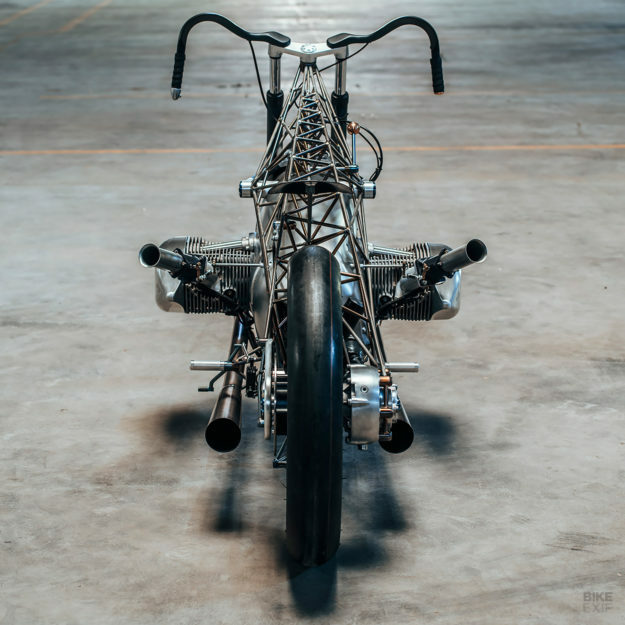 He built the huge aero-shaped valve covers, a carbon fiber seat, titanium fasteners for the axles, foot controls and a whole bunch of other pieces. Revival went the old-school hotrod route for fueling, with large-mouth mechanical fuel injection bodies, and bell mouth velocity stacks. Those stacks look like they’re in the way, but they actually splay out just a bit wider than the valve covers. With a 70” wheelbase and 23” Dunlop slicks, this BMW should run pretty stable. There’s only one brake to stop it though—a custom disc setup out back, operated on the left foot control. As an extra nod to the Henne racer, the rear wheel’s covered by aluminum discs. 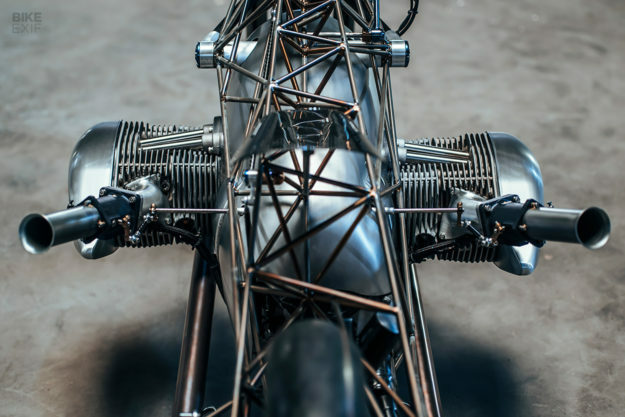 Birdcage is a remarkable blend of art and engineering; a truly out-the-box build that showcases the Revival team’s vast pool of talent. 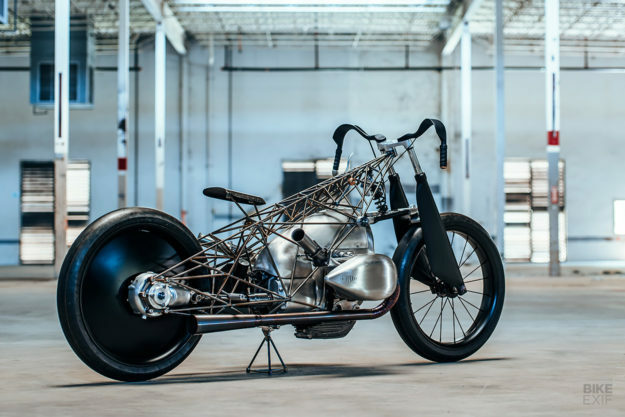 And if you’d like to see it in the flesh, just head down to the Handbuilt Show in Austin this weekend—it’s there right now, turning heads and dropping jaws. Alan would like to thank his entire team for their stunning performance: (in order) Chris Auerbach, Ty Burham, Chris Davis, Alec Padron, Ian Holt and Andy James.